Janet Marchegiani of Windber – an artist who typically works with acrylic paint and canvases to create nature scenes – found new inspiration Saturday among bins and tables of unsold items and industrial byproducts donated to Goodwill of the Southern Alleghenies. With multicolor beads and sheets of vinyl donated from a local business that makes hospital beds, Marchegiani plans to create her first sculpture. Marchegiani and more than 30 artists from the region took part in a “Waste Art Dumpster Dive” at the organization’s Centre for Social Enterprises in Paint Township, a 93,000-square-foot warehouse where staff members store and sort millions of pounds of donations, shipping some to the organization’s 11 stores and then packaging items that don’t sell for other industries or recycling facilities. 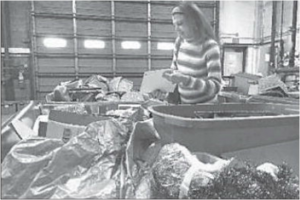 Still, about 23 percent of unsold goods went to a landfill last year. The artists sifted through tables of wooden household items, glassware, lighting fixtures, picture frames, textiles and three tables of metal. They also were allowed to put on gloves and dig into bins of unsorted discarded items. Among the most popular were byproducts from area businesses: raw steel from JWFI and rolls of vinyl from UMF Medical. The event kicked off a new endeavor for the organization, a “Creative Upcycle Exchange.” The idea is to extend the lifecycle of unsold goods and industrial byproducts by directing those materials into the hands of artists, crafters, do-it-yourselfers, makers and educators – rather than sending them to landfills, said Diana Shark, a Goodwill reuse enterprise business developer. The exchange still is being developed but plans include a space in the Paint Township facility where participants could shop for preselected items – from metal or byproducts from area manufacturers to more traditional Goodwill wares, such as wooden or glass goods and plenty of fabrics and fibers – at salvage prices, Shark said. Working with area arts organizations – Bottle Works in Johnstown, Laurel Arts in Somerset and Locality in Bedford – Goodwill selected artists who could help show the waste’s potential. The participants will have four months to create artwork that is at least 50 percent comprised of the salvaged materials. Their work is to be displayed at a Waste Art Exhibit planned for April and held in conjunction with the organization’s annual community report. The pieces also are to be featured at the three partner arts organizations and at the second annual Makers Premier at Pitt-Johnstown. Shark, also an artist who works with scrap metal, walked the artists through the sprawling warehouse, past neat rows and stacks of winter storage goods and shrink wrapped electronics to cubes of clothes that never sold. That’s where the art will be displayed in the first gallery of its kind, she said. Kecia Bal is a reporter for The Tribune-Democrat. Follow her on Twitter @KeciaBKay.